It’s almost Valentine’s Day and it’s time to show your loved one that you care. I’m not sure if you know this or not, but the best way to do that is with a delicious cupcake. If you’re a perfectionist, then you’ll want to make this strawberry filled chocolate cupcake! It’s quite literally the most amazing thing I’ve ever created. I know… it sounds intense, but holy cow… it’s good. We started with our foundation chocolate cupcake. It’s moist, rich, and can be utilized for a ton of variations. I think the biggest difference between this cupcake and others is the baking temperature and time. It’s low and slow, baby. The oven temperature is set at 300ºF and the time can vary from 19-25 minutes. Our oven produces a quality cupcake at 24 minutes. Just be sure to toothpick test your cupcakes before you decide they’re done. This recipe requires a bit of planning… You’ll need to make a strawberry buttercream and a chocolate ganache. It sounds complicated, but it’s not. The buttercream and chocolate ganache are incredibly easy to make. 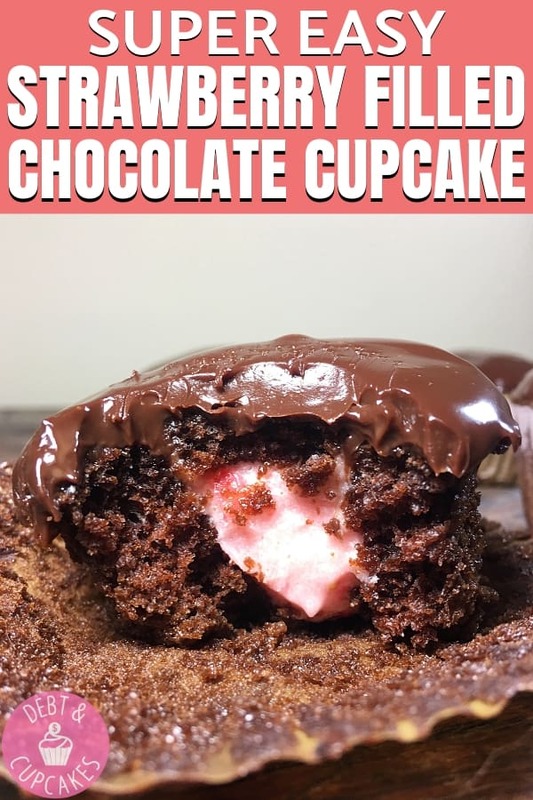 All three parts are great on their own, but come together to form the perfect strawberry filled chocolate cupcake! Buttercream is the strangest thing to make. You start by whipping some softened butter, add powdered sugar, and typically some heavy whipping cream. It doesn’t look like it should turn into creamy deliciousness… but it does! Anyway, this strawberry buttercream is a little different. You’ll need softened butter and powdered sugar, but you won’t be using ANY milk or heavy whipping cream. None. Put it down! You’ll need fresh strawberries, finely chopped. You’ll add these and their juice to the butter and powdered sugar. Don’t fret either, there is plenty of moisture and it turns into an amazing buttercream right in front of your eyes. If it’s too thin, add a little more powdered sugar. Ff it’s too thin, add more strawberries. Just remember that a little goes a long way. This buttercream is going to go inside the chocolate cupcake. So, if it’s not a perfect consistency… it’s ok. Don’t get too hung up on that. 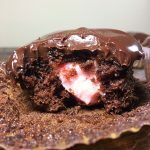 You’re strawberry filled chocolate cupcake will still turn out amazing! Tip: Cut out a pit in your cupcake to fill with your strawberry buttercream. It’s easier than trying to force it in with a small pipping tip. Plus, you can eat the centers you cut out… Win-Win! Secondary awesome tip: Use a hand mixer. It’ll allow you to evenly mix everything and produce a masterpiece. A chocolate cupcake deserves the appropriate topping, and this ganache is it, baby! The first time I made a chocolate ganache, I was shocked how easy it was to make. It’s literally some buttermilk and chocolate. Boom. You’re ready to beat Bobby Flay. The trick to a good ganache is how long you let it rest. Once you have that velvety smooth chocolate topping, let it sit for 10-15 minutes at room temperature. The longer it sits, the thicker it gets. If it sits too long, you’ll end up with a thick frosting type of icing. If you use it right away, it’ll be a thin icing. 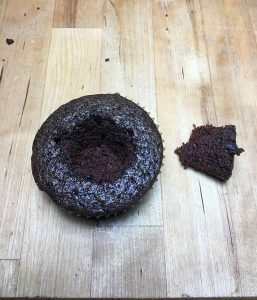 I found that 15 minutes will allow you to dip your cupcake in and it will create an amazing chocolate glaze. I’m a fan of dipping the strawberry filled chocolate cupcake in the ganache. Tip: Add a bit of the ganache to your coffee. No one will know, and it’ll taste like delicious heaven in the morning. You deserve it! If you’d like to use the tools we use to create our cupcakes, you can purchase them through these amazon affiliate links. We get a small commission off the sale, and it doesn’t increase your price at all! We appreciate the support! Measure out the chocolate chips and set aside. Add the heated heavy whipping cream to the bowl of chocolate chips and let sit for 2-3 minutes. After waiting 2-3 minutes, slowly begin to whisk the chocolate into the whipping cream working from the inside of the bowl to the outside. Allow to sit for 10-15 minute before dipping your cupcakes!